Moneyspire is a budgeting tool designed to synchronize all your financial accounts in one place so you can easily track your income and spending. The idea behind the personal finance software is to help you set bill reminders, create budgets, connect online bill pay, and even track investment accounts. If you have ever struggled to stay on top of your bank accounts, credit cards, and investment accounts, or felt like you were hitting your head against the wall reconciling accounts, splitting payments, or bulk editing transactions, Moneyspire is designed to be the solution to your problems. Considering how much value is jam-packed into the Moneyspire budgeting software, the one-time price point of $59.99 is fair, and compares well to other budgeting tools. But with so much competition, is Moneyspire worth it? It is hard to stay on top of your day-to-day finances when you have to log in to so many online accounts to keep track of your income and spending, as well loan payments, credit card bills, and investment performance returns. Moneyspire is designed to provide you a holistic view of all your accounts, so they are all in one place. Whether it is your Amazon Prime Rewards Visa Signature Card, bank checking account, student loan, Kohl’s card, car loan, or almost any other financial account you may have, Moneyspire connects to them all and displays them in a dashboard for easy viewing. With an overview of your spending, income, and liabilities, you will have a more detailed view of your accounts. It is straightforward to categorize income and spending and to balance your checkbook. One of the standout features is billing and deposit reminders. 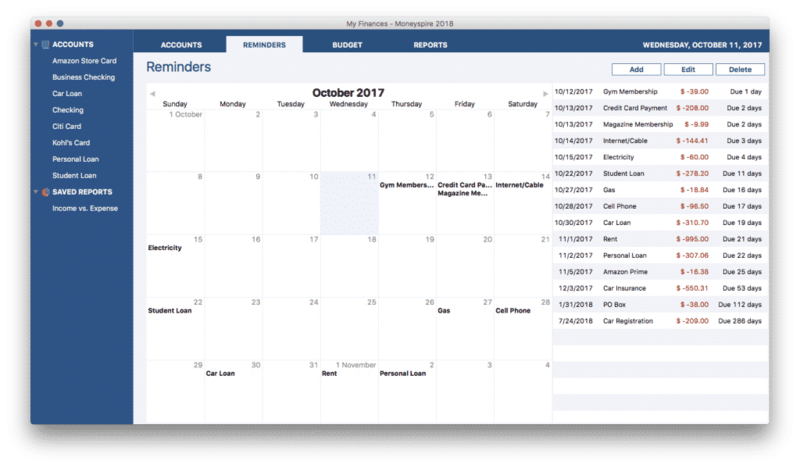 The calendar view lets you schedule upcoming bills, so you are not penalized by late fees when it slips your mind to send in payment on time. We found the due date notification system next to the calendar to be an especially nice feature that informs you when the next bill payment is due. By aggregating all your accounts into one place, you also get to see a big picture pie chart of how and where you are allocating your money. For example, you will see what percentage of your money is spent on groceries, food, loans, childcare, gifts, and so on. 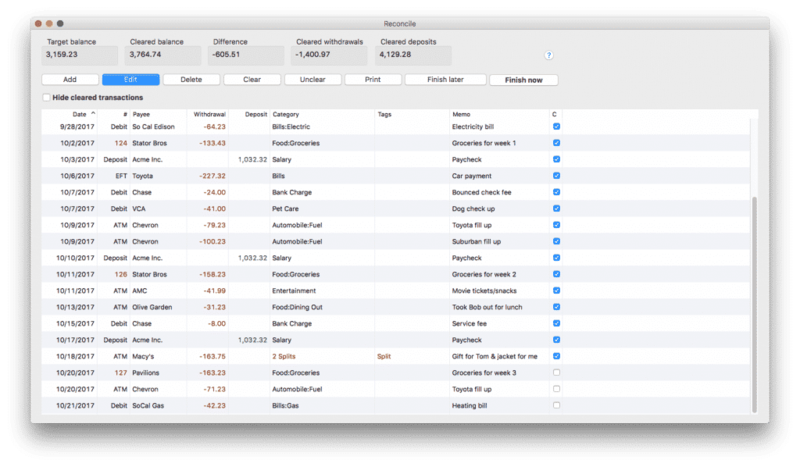 When you view all your expenses in one chart, you can quickly see which costs have a large impact as well as which ones may be small but could be avoided, and removed in the future. 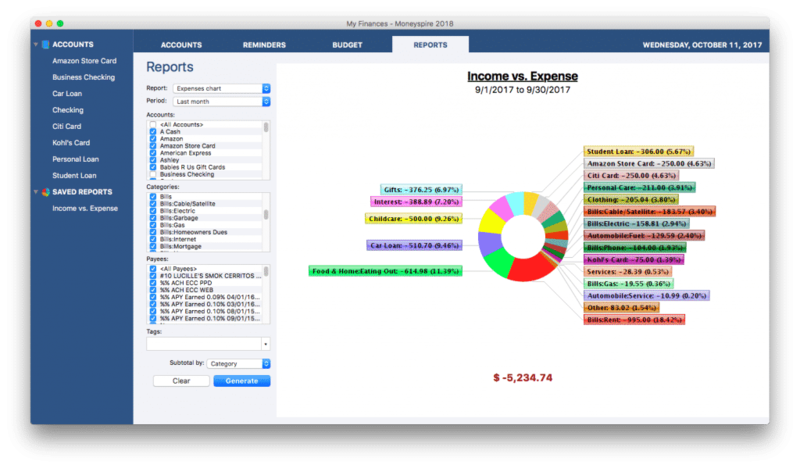 And while the overall visual interpretation is helpful to spot major spending patterns, you can set a budget to more accurately keep track of spending on utilities, rent or mortgage, healthcare, insurance, and so on. If you overspend or underspend, the difference is easily spotted. A really nice feature to help you avoid unwanted financial surprises is the balance forecast chart. Instead of getting hit with a surprise bill or even a regular bill that depletes your cash balance when it’s too late, you can virtually peer into the future to see how much you will have over the course of a month and make adjustments ahead of time. For example, if you know you will be low on cash in 3 weeks when bills are due, you will be more likely to skip an impulse purchase of a new pair of shoes. If you don’t mind getting into the nitty gritty details to make sure every transaction is accounted for then the reconciliation area of Moneyspire will be to your liking. You can verify that each transaction is correct, and that no errors or fraud has taken place in any of your financial accounts. 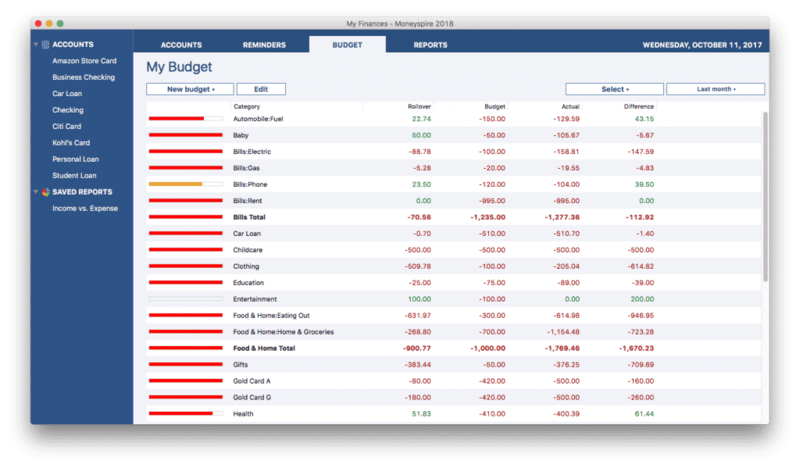 Beyond the popular budgeting features, Moneyspire has a bunch of extra features to simplify your finances too. You can connect to your financial accounts directly online and import transactions automatically so you don’t have to get stuck with manual imports. If for any reason your bank doesn’t support Direct Connect, Moneyspire Connect, an alternative service, can simplify the process for you. Whether you are transferring between accounts located in different currency regions or simply downloading currency exchange rates, Moneyspire can handle currency requests. The last thing you want to do is import financial transactions manually, and you don’t have to because Moneyspire supports a wide variety of file formats, including: CSV, OFX, QFX, and QIF. Moneyspire supports check printing on blank check stock, and caters to easy calibration of different check types. The first step in getting started with Moneyspire is to download the application onto your computer – all data is encrypted on the hard disk. Next, link your bank accounts, investment accounts, and credit cards. 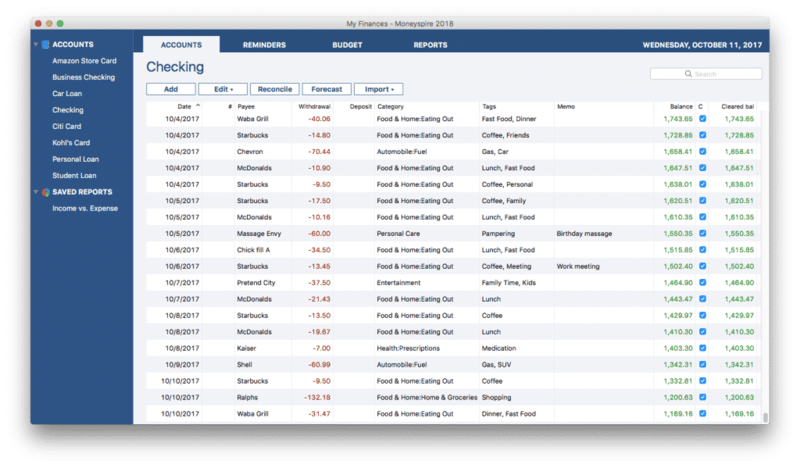 You can view your accounts all in one place right away, as well as create budgets and set bill pay reminders. Moneyspire is accessible on many devices without any license restrictions, so you can add it to your mobile devices as well as move data to the cloud, which makes it accessible anywhere you have an internet connection. If you run into any issues, Moneyspire has an extensive FAQ section, online video tutorials on YouTube, as well as helpful customer support to get you squared away. Moneyspire provides a free 30-day trial to let you evaluate the software and thereafter charges a one-time fee of $59.99. ✅ Low Cost Budgeting Tool: The one-time cost of Moneyspire is $59.99, though you can get started with a 30-day free trial. ❌ No Android Support: Moneyspire caters to iPhones and iPads but mobile support for Android devices is not available. ✅ Sync All Accounts In One Place: Bank accounts, credit cards, investment accounts, and loans (auto, personal, home) are all featured in one dashboard for easy viewing. ❌ Dashboard Polish: Compared to state-of-the-art free mobile financial apps, such as the one offered by Personal Capital, Moneyspire lacks a little polish when it comes to design. ✅ Investment Account Support: A lot of budgeting tools support bank accounts and credit card accounts but few support investment accounts, so Moneyspire earns high marks for this feature. 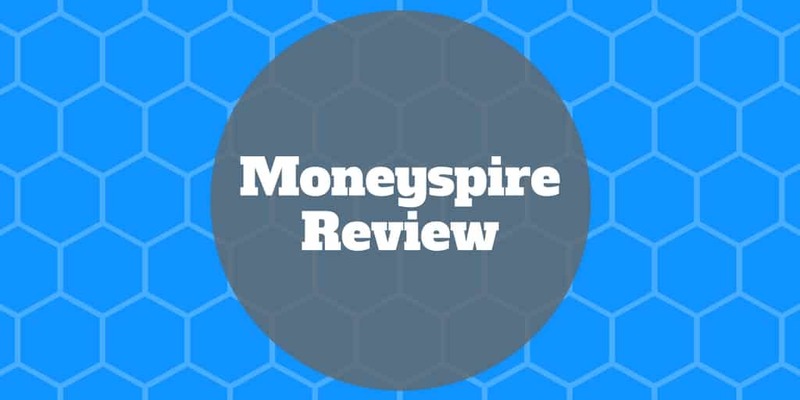 ❌ User Reviews: Customer reviews are somewhat mixed with some complaints that Moneyspire is a bit clunky to use and not as intuitive as customers might like. ✅ Mobile App: Whether on your computer, tablet, or phone, you can stay connected to your personal finances now wherever you are. ✅ Moneyspire Cloud: An optional feature is to store all your data in the cloud so that you can access it anywhere, for example when you are on vacation. ✅ Unlimited Device Usage: You won’t be limited to a single license per device with Moneyspire, so you can use it on all the devices in your home. ✅ Mac & Windows Compatible: Windows 7 and later versions are compatible as well as MacOS 10.9.5. ✅ Security: Data is stored in an encrypted format on your computer’s hard drive and never transmitted to ensure security is paramount. Moneyspire is a budgeting tool designed to help you keep track of your spending and income, as well as to notify you when it is time to pay bills so you can avoid late and penalty fees. Unlike many budgeting apps, Moneyspire supports investment accounts as well as bank accounts and credit cards. However, it only supports Apple devices when it comes to mobile, so Android users should consider Personal Capital or YouNeedABudget. All your information is encrypted on your own computer’s hard disk for security but if you want to access your personal finances on-the-go, you can choose the option to transfer data to the Cloud. The one-time price of $59.99 is slightly higher than the pricing charged by other monthly budgeting apps, though the user interface isn’t quite as polished. Still, Moneyspire has features that many other budgeting tools lack, such as currency support and no license restrictions on device downloads. All in all, Moneyspire is a solid financial budgeting app that does just about everything you will need it to do once you are up and running, and best of all, you can get started free as part of a 30-day trial to check it out without risking a dime.